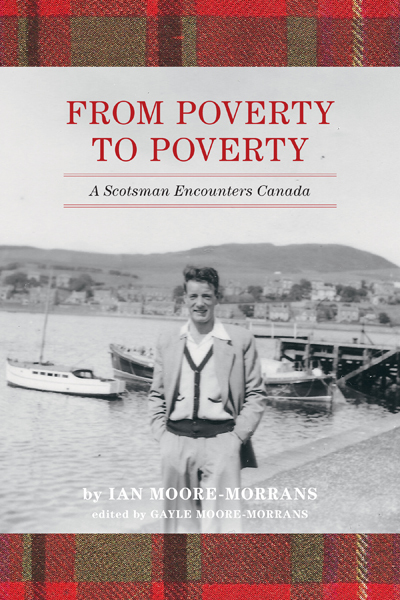 The photo you see on the cover of my latest book was taken of me when I visited my hometown, Campbeltown on the Kintyre Peninsula, Argyllshire, Scotland in 1957. It shows a lots-younger-and-leaner me with Campbeltown Harbour in the background. Many folk have been curious about the title of this book and how I came to write it. If you click on the page bearing the book’s name at the top of my home page, you can read a synopsis of the story and the title will become clearer. know me, if they so desire. inquired where in Scotland they came from, she didn’t know. the first volume—all done and delivered! remember it, albeit sometimes a trifle fuzzy. I have occasionally changed a person’s name to maintain their privacy. The only incorrect information might be a street name spelling or a slight error in a date; but be assured that all that is included really did happen. It is my life, written with the express intention of filling in information that will not be accessible after I am no longer living. I’ve tried to remember the good times, the bad times, the funny times and the sad times, from 1935 until 1970. The second volume (“Came to Canada, eh?”, as yet unpublished) will cover the years 1970-2004, maybe even later than that if I continue living and writing. My present wife and editor is urging me on to book three! This entry was posted in Autobiography, Biographical info, Scottish theme. Bookmark the permalink. Nice of you to repost. Thank you.